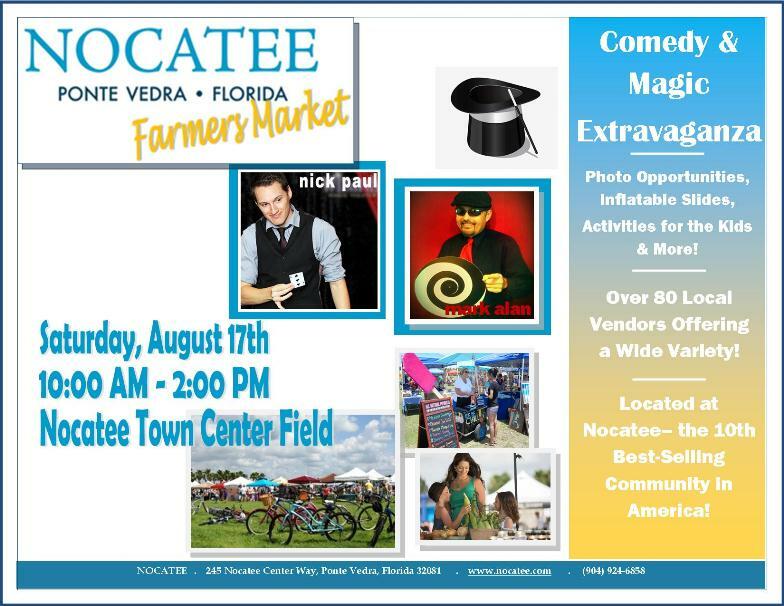 Residents and community guests will be celebrating a “Comedy and Magic Extravaganza” themed Nocatee Farmers Market on SATURDAY (August 17th)! The day of family-friendly fun will include multiple performances from magicians Nick Paul and Mark Alan at 10 a.m., 11 a.m., noon and 1 p.m. Each show is set to include entertaining and magical feats, crowd participation and more on the centrally located Farmers Market Stage. In addition to these performances, there will also be a “strolling magician,” photo opportunities, inflatable slides, activities for the kids and more. Joining this month’s special entertainment will be more than 80 local vendors offering a wide variety of delights that will include baked goods, organic produce, honeys, local restaurant favorites, hand-crafted jewelry, artwork, herbs/spices and more at the newly relocated Farmers Market Field in Nocatee’s Town Center. The Market is held every third Saturday of the month between 10:00 a.m. and 2:00 p.m., and is open to the public.